This is Part Three of a four part look at the different views of outdoor hockey. Part One and Part Two are found here. The following is a repost from caseandpointsports.com. In 2011 I was fortune enough to snag a media pass to attend the NHL's premier event, the 2011 Winter Classic in Pittsburgh, PA. This was my view from the dry seats. I truly believe this was the time that the Winter Classic became just another event and became a true spectacle. Between the hype leading up to the game, which only increased by the game being pushed back, and the HBO series (concluding tonight at 10pm), the game received more attention than ever before. Combined with the fact that it had the two biggest stars which, though under achieved in the game, still made their presence known added to the hype of the game. The spectacle of the players playing in an obvious rain storm added to the "Did you see that?!" appeal of the game that could attract viewers next year. What I feel bad for are the viewers, though. And this is not a complaint about NBC's broadcast (though having watched it later, was rough to watch at times). NBC did a fine job. They tried new things in their over head cam that were fine in theory but just didn't work. Bravo on them for trying something new. Why I feel bad for the viewers is because of what the viewers missed out on. What the viewers miss, what the TV doesn't quit capture, was the truly amazing and emotional feeling in and around the stadium. As a Pittsburgher by birth and a Penguins fan before any other team (the Steelers are essentially 1B, but the Penguins are still #1) seeing this event here was outstanding. Walking around the city I love and seeing so much love and desire for this amazing sport was fantastic. Walking into the stadium and seeing a rink built in the middle of the field was awe inspiring. The positive it brought to the city I love and hope to one day inhabit was through the roof. Stepping back a bit from that and looking at the game, it was equally amazing. As I drove up to Heinz Field on game day and I looked around at the sea of Black, Yellow, and Blue jerseys I was amazed. Just a handful of years ago, when players like Rico Fata, Konstantin Koltsov, Tom Kostopolous, Drake Berehowsky were the headliners, this team was dead to rights. 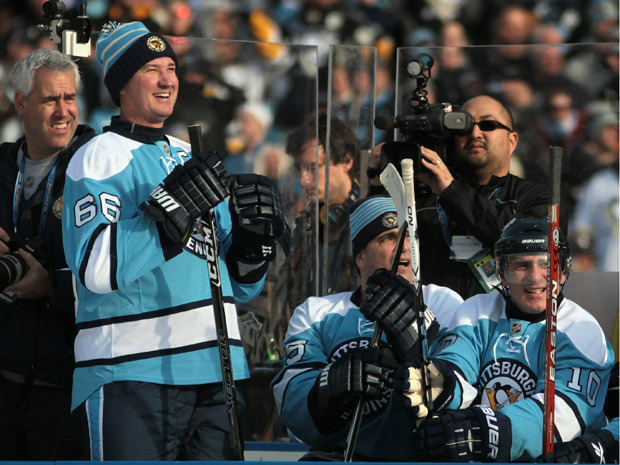 An old, aging arena and an old, aging star in Mario Lemieux were the cornerstones of a team that was lucky to draw 11,000 people on any given night. To drive up and see roughly 35,000 Penguins fans (only saw one Steelers jersey the whole weekend, at the Alumni Game) packing this event... mere years after the very real threat of re-location to Las Vegas, Kansas City, Portland hung over it's moribund head, to see the hockey fever that had swept the city and is a legitimate threat to the popularity of the Pittsburgh Steelers, was a testament to what had been accomplished through solid drafting (with some luck thrown in) and stellar marketing, plus fantastic management. The person I would have loved to talked to would be Brooks Orpik. 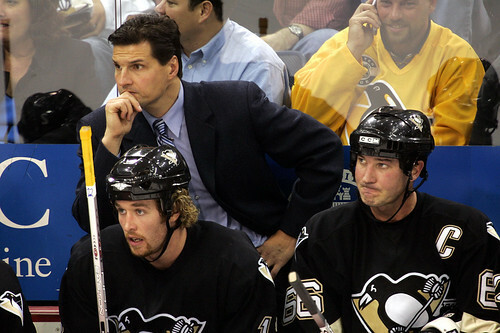 His rookie year was the putrid 2003-04 season when the Penguins lost 47 games, including 18 in a row at one point. 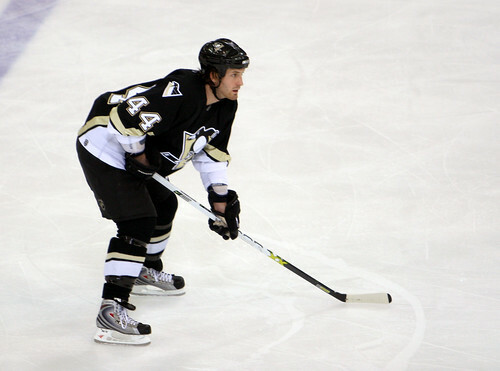 He is the Penguins longest termed player and has been on the squad as they went from best dwellers to one of the prominent teams in the league. To discuss the team arch during his career (one that saw him take about $1 million per year less to stay with the team) would be fascinating. The NHL Winter Classic is an established event that only has potential to grow. It is something the NHL can only do in terms of the special spectacle of the event (playing in an arena far unusual from their normal trappings) and unlike other leagues this one game spectacle counts for something, even if it is only just two points. It's something that will happen every year for the foreseeable future but for one weekend it was extra special. It signaled just how far one franchise, who was damn near flat lining, has come. From bankruptcy, potential re-location, and general apathy to a brand new arena, enough fans to populate Heinz Field, a Stanley Cup, and the league's biggest star... it was damn special. The 3-1 Capitals victory is something I will remember only when going into the greatest detail. A Penguins loss put a minimal damper on the events. The crowd, the atmosphere, the elements, the history, wide eyed way every single of the 68,111 fans in attendance took in the event will be what lingers. Things like taking the ice, standing at center, seeing all of the yellow seats. Talking to Mario Lemieux, my foremost hero, being taller than Darren Pang, being in the Penguins and Steelers locker room, hearing the power play goal being scored by Ron Francis from Mario Lemieux and Paul Coffey, the sight of heavy rain falling onto the ice, meeting Stephen Page, randomly passing Pat Sajak in the halls, shaking the hand of Franco Harris, the Terrible Towels all waving at once after Evgeni Malkin scored, hockey under the lights... these will all take precedence over the 3-1 final. And it should. For as much as the Winter Classic counts for two points, it's about the event. The spectacle, the celebration of hockey. I made sure to celebrate every moment. I combined my love of hockey, Pittsburgh, and the Penguins and I celebrated for three exhausting days. It was a memory and a moment in time I will never, ever forget. It was beautiful. If you enjoyed it on TV, it was only a fraction of the thrill as being there. I sincerely hope one day you all get the chance to experience it, too.